Applying data governance principles and practices with the BI environment is an important step in ensuring that business people understand its importance and contribute to its implementation. As data becomes more voluminous and data sources more various, the opportunities to fail in Business Intelligence (BI) become ever greater. Such failures often arise from problems with data quality or issues with data preparation and delivery to the business. An over-emphasis on self-service and data discovery approaches can also lead to such shortcomings. Fail even once, and business begins to lose trust in the BI service and looks elsewhere for its data and decision-making support. Comprehensive BI data governance is thus a vital part of any modern decision-making support system. Beyond the procedures, roles, and rules of general data governance, in the BI environment, data governance must be embedded and managed in the system itself. 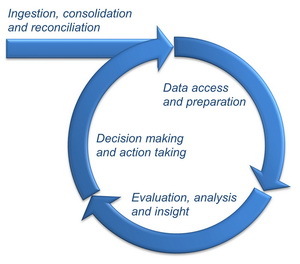 Based on an understanding of the path from data to decisions, this paper offers three cornerstones of BI data governance: (1) decision making as a process, (2) a single, integrated platform, and (3) an adaptive decision cycle. It also reviews the data governance functionality offered by Yellowfin, and most recently updated in version 7.3+, which play strongly in support of the above cornerstones of BI data governance.